After a long trip southwest of DC I arrived late last night at my parent’s house. I was still debating on whether I should have delayed the trip by a week, but it was already planned and I went. Timing is everything, a huge storm hit Washington,DC last night downing trees and power lines and causing a power outtage to a large portion of the the city. My neighborhood has no power and probably won’t for another 5-7 days, and my internet/cable provider had fiber optic lines cut and their service is down for a while. So had I stayed I would have had no power or internet and this project would be disrupted for a while. Instead I am in the mountains surrounded by lots of trees and plants material. In the next few days I’ll start trying to do some surveying of what I want to use and make some notes and maybe some sketches (and doing my best to avoid the bear that has started showing up here looking for food). 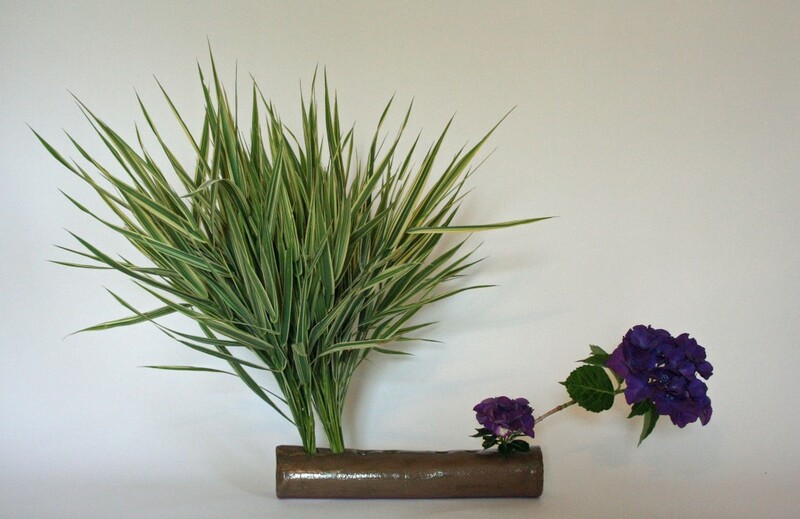 For today my ikebana is in a self made vessel with grasses and hydrangea from my mother’s garden.